“Noelene has a passionate heart for God and wants to ignite our passion for God too. 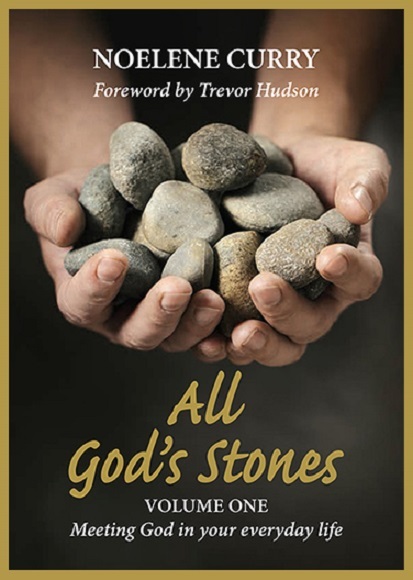 She does this in her new book, All God’s Stones, by sharing eight down to earth reflections on our life with God in the midst of the messes and muddles of our everyday lives. There were a number of things that I appreciated and I think you will too. First of all, Noelene does not write as someone who is above her reader. In the book we meet someone who could live next door to us-an ordinary wife, mother, friend who seeks to follow Christ as faithfully as she can within the challenges and crises of her own life. In simple and straightforward language she passes on to us those lessons she has learnt through her own discipleship. She lives the words she has written. She is a credible witness. Secondly, she loves to link her everyday experiences with the words of Scripture. By doing this she encourages us to meet God in all the experiences and encounters of our lives. Because we suffer from unhelpful tendencies to separate our faith and our lives, to compartmentalise our Christianity, this encouragement can serve us well. She really wants God to be God of our whole lives. I am reminded of Jesus’ invitation to seek first the kingdom of God and then everything else will find its rightful place in our lives too. Finally, by sharing her life and faith so generously with us, she gives us a glimpse of how God acts in our lives. In the book we are introduced to the God who encourages us through our friends, who meets us in our struggles, who speaks to us through those God-incidences that happen, who touches other people’s lives through our words and so much more. By doing this Noelene whets our appetite for a deeper walk with God in our own lives. This entry was posted in Author, God, Life and tagged faith, grace, restoration, wholeness. Bookmark the permalink.